Browse: Home / HEATHEN – Internet Of Things Pentesting Framework. 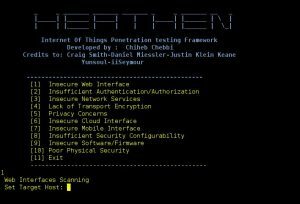 Heathen IoT of Things Penetration Testing Framework developed as a research project, which automatically help developers and manufacturers build more secure products in the Internet of Things space based on the Open Web Application Security Project (OWASP) by providing a set of features in every fundamantal era. ← TheFatRat v1.6 codename: Tasty – Backdoor Creator For Remote Access.